I have a long-pod Tabernanthe iboga (Iboga) plant in my possession and they are getting ripe at the moment. I would sell the seeds in bulk quantity. If you are interested, send inquiry to dbotany@myway.com. I've never really thought that someone in Russia could actually grow the novo up until fruiting. But this guy did. I sent his seeds on the fourth of July 2008 and he received them on July 17th, 2009. Later on August 31st 2009, I received his message with some pictures of his mature plants. I must say that I was so impressed. He wants me to share his pictures with other growers through my website, so here it is, his story. 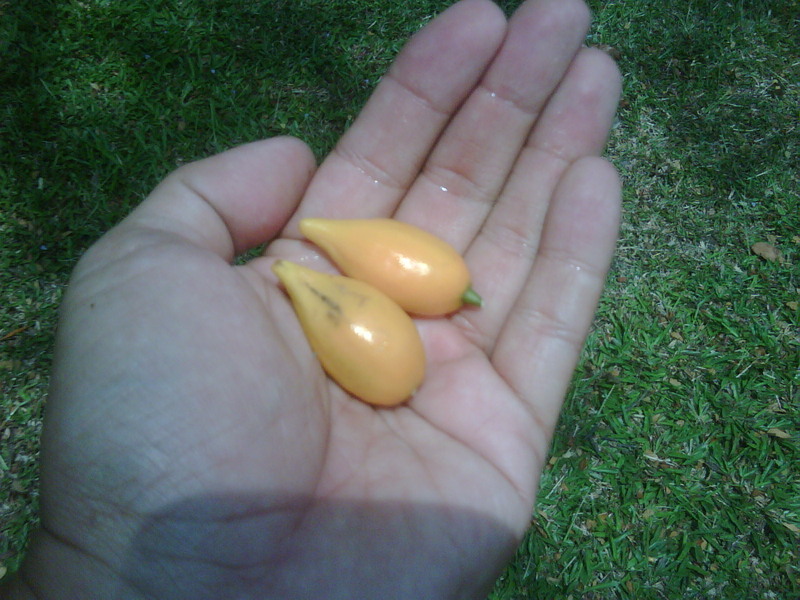 I have received from you a year ago, the seeds of your wonderful plants. 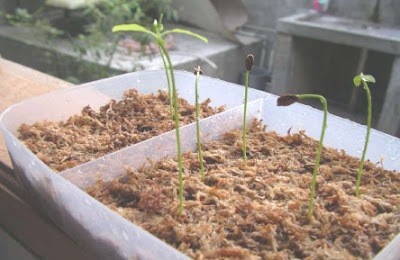 The seeds came in a hot dry season with moss but the seeds were viable. And out of 30 sprouted 29. I was searching for different modes and conditions for the plant growth, so the strongest have survived. A year and one month later I received a lot of flowers on my plants. And from many flowers I have received one viable seed. Recall that from planting of seeds was only just 1 year and 1 month. Some plants have a growth of 1 meter. And I had the opportunity to harvest the leaves off twice. I am very grateful to you, D. You gave them who live in countries with cold climate the possibility of unusual sense of communications with the ancient plants of the Incas. From Russia with great gratitude. D, you can post at your site my letter to you, and my photos, if you want. I could not myself place them on your site. Some of my plants are growing near a window, under normal lighting the entire year. But others grow up in the box with the lamp DNaT 250 watts and 250 watts mercury DRL. Only the first month, they need moisture, when you need to reset the covers from the seed and root. This time they spent in the closed minibox. Minibox green color is present on my first photo but without the glass cover on top. And then, they grew normally without shelter. Happy hot up to 30 or even higher. The temperature at night, especially in winter and dropped to 15 -18 degrees. You send us a kind Eritroksiluma very hardy. One plant genetically predisposed to flower with 11-12 hour days. Other plants bloom, even with 18 hours of the day. Blooming better place in the branches of the third and second order. I acidified water ascorbic acid irrigation. One container represents a perforated plastic grid that is growing the plant in the ground. Earth is not too fertile, loose and easily lets the water and air. And this is a plastic container in another container without drainage holes. At the bottom of the container with a layer of expanded clay casting up 3 cm. As well as around the same space is filled with expanded clay. At the bottom of the tube are omitted to permit blowing air, to learn about the presence of water. The water must first be poured over the ground. Later, you can pour water through the expanded clay side of the container. Because the roots will sprout to the bottom of the container. Through the tube can be purged mouth that sometimes enriched water at the bottom of the air. Also, fl can learn about how much water be available in the container. Water must not be more than 2 - 3 cm. Water should be slightly acidified and do not contain calcium and magnesium. Water can be boiled, to precipitate the salt, or to insist on a red acidic peat. Or acidify ascorbic acid. Fertilizers should be added very carefully so as not to burn the young plants. Some plants died after I added the dry fertilizer of slow assimilation - sticks, which slowly dissolve in the soil. Despite the fact that I was guided by the instructions, but the dose was extremely high for this. Better to use conventional soluble fertilizer at half the dose of this in the instructions. Or use the tested and proven Slowly soluble fertilizer. I have used with great success fertilizer «AVA Universal» . In drawing up the land of the mixture, I added crystals fertilizer «AVA Universal» long-lasting. For flowering I used “Zdraven” fertilizer for flowers. CPP - 16, 9, 20, magnesium -1,5% and others trace elements. But everyone can choose for themselves the best fertilizer. Above all, do not overdose on them. Plants need the introduction of chelated iron. I sprayed them and brought under irrigation. You can also spray the plants with boiled water with the drug Emerald, where there are magnesium and nitrogen. I use moistened sphagnum moss as a seed starter for 2 reasons: firstly, I read that sphagnum moss has natural fungicide properties in it. And secondly because I do not need to water oftenly (sphagnum moss is very good at holding water). Alternatively, you can use coconut peat (obtained from coconut husk). I haven't tried vermiculite but I've heard that it works too. 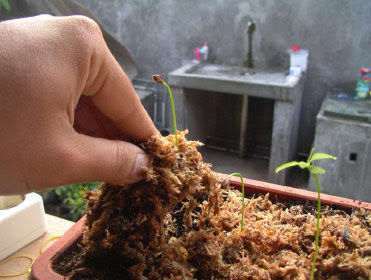 If you don't have sphagnum moss, cocopeat or vermiculite, consider using worm castings. Earthworm castings also have the added benefit of being loaded with other beneficial, hygienic microorganisms that will help your plants fight powdery mildew, rust, black spot, and a number of other fungal pathogens through competitive exclusion. Competitive exclusion is the process by which one species dominates and eventually excludes another from surviving. With worm castings you get so many beneficial organisms that the pathogens do not stand a chance of survival. I would not advise you to sterilize the medium, as it tends to encourage fungi/molds. There are 2 reasons for that: first, no matter how sterile your medium is, there is no way you can do to keep it 100% sterile, unless you have a sterile environment and sterile equipments. And, since the heat may kill all the microbes in the soil, it will likely become an excellent substrate for pathogenic fungi, because the fungi can now grow without competion. 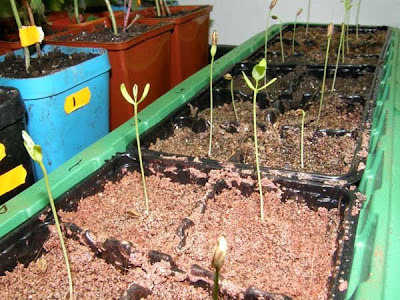 When the seedlings are strong enough, you can transplant them to the new medium. This time, I use a potting mixture consisting of 1 part soil and 1 part leaf compost. You can replace the leaf compost with bat guano, bird guano, horse manure, or any medium that is rich in organic matters. 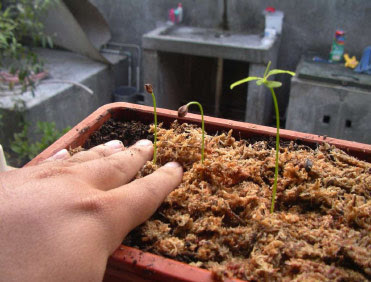 Whatever potting mixture you use, remember that the main reason for transplanting the seedlings is to give the seedlings proper nutrients and proper pH (acidity level). Therefore you need to know the soil characteristics in your mixture. Later I will discuss about soil in detail. Inter- and Intra-Specific Variation Among Five Erythroxylum Taxa Assessed by AFLP. The four cultivated Erythroxylum taxa (E. coca var. 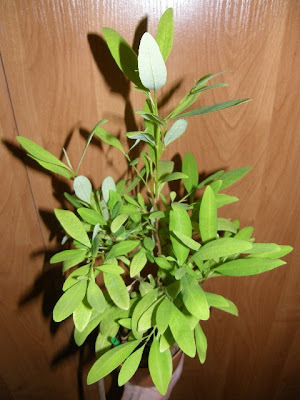 coca, E. novogranatense var. novogranatense, E. coca var. ipadu and E. novogranatense var. truxillense) are indigenous to the Andean region of South America and have been cultivated for folk-medicine and, within the last century, for illicit cocaine production. 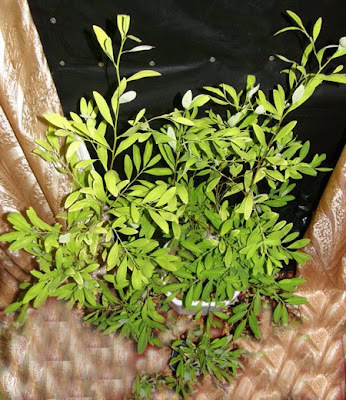 The objective of this research was to assess the structure of genetic diversity within and among the four cultivated alkaloid-bearing taxa of Erythroxylum in the living collection at Beltsville Agricultural Research Center. Amplified fragment length polymorphism (AFLP) fingerprinting was performed in 86 Erythroxylum accessions using a capillary genotyping system. Cluster analysis, multidimensional scaling (MDS) and analysis of molecular variance (AMOVA) were used to assess the pattern and level of genetic variation among and within the taxa. A clear distinction was revealed between E. coca and E. novogranatense. At the intra-specific level, significant differentiation was observed between E. c. var. coca and E. c. var. ipadu, but the differentiation between E. n. var. novogranatense and E. n. var. truxillense was negligible. 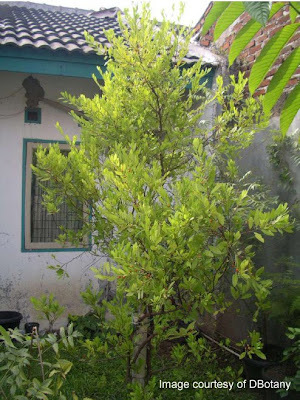 Erythroxylum c. var. ipadu had a significantly lower amount of diversity than the E. c. var. 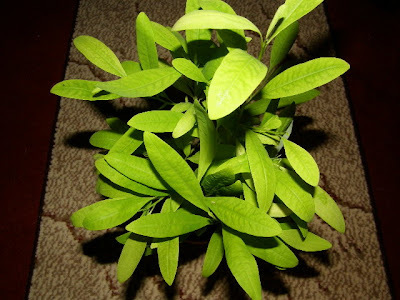 coca and is genetically different from the E. c. var. ipadu currently under cultivation in Colombia, South America. There is a heterogeneous genetic structure among the cultivated Erythroxylum taxa where E. coca and E. novogranatense are two independent species. 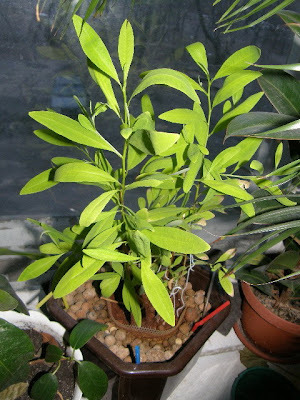 Erythroxylum coca var. coca is most likely the ancestral taxon of E. c. var. ipadu and a founder effect may have occurred as E. c. var. ipadu moved from the eastern Andes in Peru and Bolivia into the lowland Amazonian basin. There is an indication of artificial hybridization in coca grown in Colombia. Ann Bot (Lond). 2005 Mar;95(4):601-8. "Plants, like people, have to worry about inbreeding, and they have various mechanisms to insure they do not pollinate themselves. One means of encouraging cross-pollination is to have the lengths of the styles-the elongated parts of the female organ-vary relative to the length of the stamens, the male or pollen bearing structure, within the flowers of the population. Technically, this adaptation is known as heterostyly. Both Trujillo and Bolivian coca are strongly heterostylous and do not self pollinate. Colombian coca by contrast, is self-compatible. In other words, a single shrub is fully capable of producing viable seeds on it's own, a usefull trait for the individual plant, but less helpful in an evolutionary sense for the species. The breakdown or loss of this mechanism that prevents plants from fertilizing themselves is universally recognized in botany as a derived or more recent trait. Thus Colombian coca most certainly evolved after both Trujillo and Bolivian." 2. E. novogranatense var. truxillense (Trujillo Coca). Erythroxylum coca var. coca Lam. (E. coca) and Erythroxylum novogranatense var. 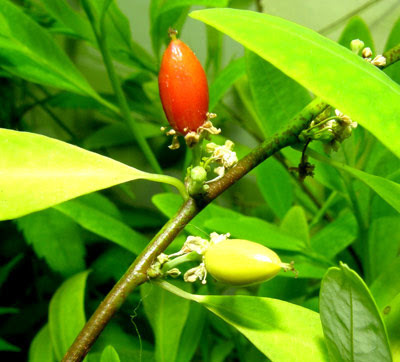 novogranatense (Morris) Hieron (E. n. novogranatense) are two of four Erythroxylum species grown in the tropics of South America for cultural medicines and the alkaloid benzoylmethylecgonine. In a published study of biomass production over a soil pH range of 3.5 to 7.0, E. coca grew best at a pH equal to and below 5.5, and E. n. novogranatense grew best within the pH range of 4.7 to 6.0. Erythroxylum coca was tentatively classified as more tolerant to metal toxicities [aluminum (Al) and manganese (Mn)] than E. n. novogranatense, however, concentration patterns of mineral elements for E. coca and E. n. novogranatense tissue have not been reported, nor have the mechanisms of differential acid-soil-tolerance been elucidated. In the current study, the effects of soil pH on concentrations of Al, calcium (Ca), copper (Cu), iron (Fe), potassium (K), magnesium (Mg), Mn, and zinc (Zn) in leaves, stems, and roots were investigated. At pH 3.5, roots of both species accumulated high concentrations of Al that decreased as soil pH increased, however, there was no pH x species interaction. 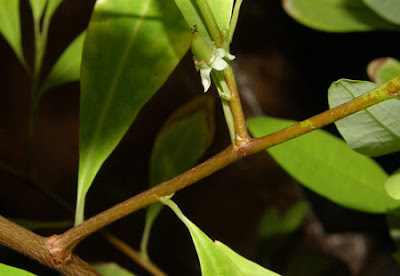 The highest concentration of Ca was found in the leaves of both species, however, E. coca accumulated more Ca as soil pH increased than did E. n. novogranatense. Manganese and Zn levels were highest in roots of both species (E. coca and E. n. novogranatense); levels in all tissues decreased with increasing pH. Manganese concentration was highest in roots of E. coca and Zn concentration was highest in tissues of E. n. novogranatense. Copper, Fe, K, and Mg levels were erratic with increasing pH, indicating that sufficient amounts of these nutrients are acquired at low pH levels. Root concentrations of Fe and K in E. coca increased markedly between pH 3.5 and 4.7. At pH 3.5, E. coca demonstrated no symptoms of mineral deficiency and/or toxicity, however, chlorosis, leaf distortion and root atrophy were prevalent at pH 6.5 and 7.0. By contrast, E. n. novogranatense demonstrated diminished growth and root atrophy at soil pH 3.5, whereas at pH 6.5 and 7.0, although biomass production was reduced, no symptoms of mineral deficiency and/or toxicity were present. The species obviously behave differentially at pH extremes and E. coca appears to be most tolerant of extremely acid soils; the two species may also differ in mineral sensitivities between the species at higher pH levels. Erythroxylum coca may compete more effectively with Al for Ca binding sites within the root, and may have greater internal tolerance of Mn, compared with E. n. novogranatense. Hey D, I just measured the hydroponic EC as opposed to the soiled EC, these are both seedlings and the EC hydro is at least 3 times larger than the soiled EC. It has been in the system for two weeks, the leaf count on the Hydro is 8 leaves and 17 leaves on the other 2. The 3 specimens on the soiled EC still only has 4 leaves on 2 and 3 leaves on 1. The stems on the hydro are thicker and the overal health and vigor on the hydro are much better. The EC hydro is triple the size of the soil type. So far the hydro on EC and EN are performing much better. I just dont know about the alkaloid count in the 2 types but I would guess that the hydro has more. My reasoning for this is that the hydro is getting all the nutrients it count want 4 times a day and then the rest of the time the roots are breathing O2 between watering. I recomennd you trying hydro. You can assemble your own very easily. D, I gotta tell you so far in the 1 year old EN from last year. In the past 3 weeks the amount of new leaves and new growth is unbelieveable. I took a plant that was doing somewhat ok and now looks like it gonna be a big bush in a few more months. I am giving 15 minutes of liquid 4 times a day only one time at night. The liquid is comprised of micro nutrients/growth nutrient and then I added 1/2 teaspoon of superthrive and 2 other ingredients that I think are making the difference one is called Majic (iron and magnesium) and the other is Sugar daddy (iron nitrogen and glucose). I also have a additive that has alot of amino acids. The EN is doing very well in the hydro better than the soiled way. The EC looks good and a fair amount of growth but still looks like it is having a bad day. But with time it might be looking real good. The soiled EC seedlings dont look as good as the hydro seedlings. 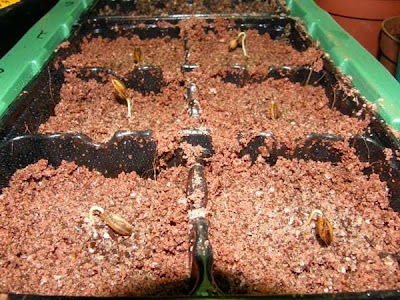 I do beleive that it is better to move them into the hydro system when they ar larger but more important larger roots. I will keep you updated on the growth. Oh by the way I have the EC in a solution that the pH is 4 and the EN is about 5-5.5 pH. I made that decision based on the article you sent me a few weeks ago. Hydro is a real nice method to grow plants you know exactly what your giving it and you know how the plants are doing real fast. The growth rate compared to the soiled method is night and day. I hope you find this interesting and please hit me with any questions if you have. Erythroxylum coca var. 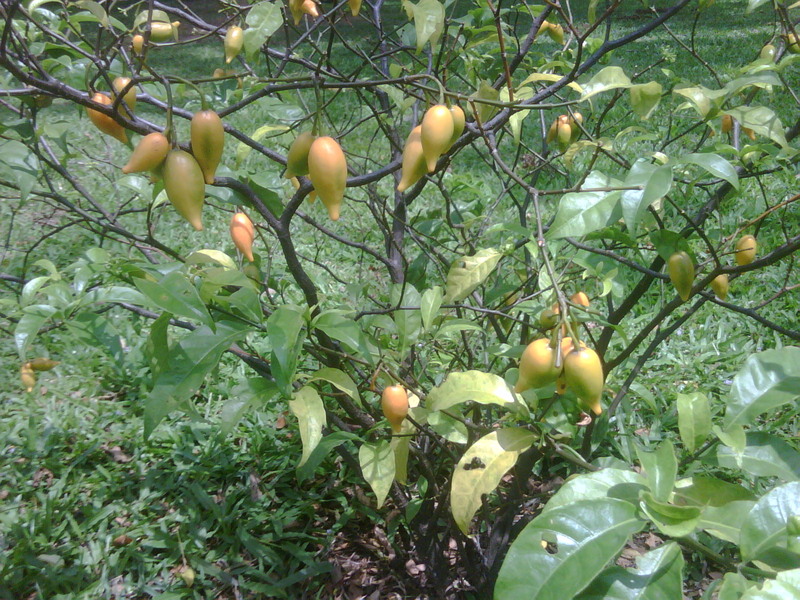 coca Lam. (E. coca) and Erythroxylum novogranatense var. novogranatense (Morris) Hieron (E. novo. novogranatense) were grown in greenhouse pots of Monmouth sandy loam, over a pH range of 3.5 through 7.0, to determine patterns for biomass accumulation and the content of hygrine, tropinone, methyl ecgonine, cuscohygrine, tropacocaine, cocaine, cis- and trans-cinnamoylcocaine in their leaves. Optimal growth for E. coca occurred at pH 3.5, and for E. novo. novogranatense at pH 4.7 through 6.0. The pH extreme (sub-optimal biomass accumulation, above and below optimal pH) for E. coca was equal or higher than 6.5 and for E. novo. novogranatense was equal or lower than 3.5 and equal or higher than 6.5. Hence, E. coca is tentatively termed a calcifuge (Al-tolerant, Fe-inefficient) while E. novo. novogranatense more nearly resembles a calcicole (Fe-efficient, Al-sensitive). Increases in leaf alkaloid content observed at the pH extremes for E. coca and E. novo. novogranatense appeared to be caused by plant stress. E. novogranatense var. Novogranatense was more tolerant to the high pH extreme than E. coca. 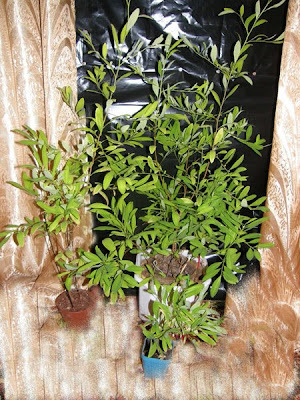 Twenty-two months after transplanting, 55 % of E. coca plants grown at soil pH 7.0 died, and those that remained were chlorotic. In addition, among E. coca plants grown at soil pH 6.5, only 55 % were alive at the third harvest. 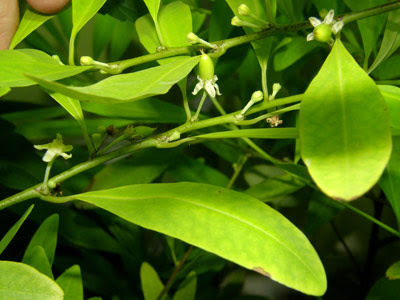 Cocaine concentration in E. coca was independent of leaf biomass. Leaves of E. coca grown in soil at pH 3.5 through 6.0 had higher concentrations of cocaine than those of E. novo. novogranatense. Conversely, leaves of E. novo. novogranatense contained a higher concentration of trans- and cis-cinnamoylcocaine and methyl ecgonine than those of E. coca. 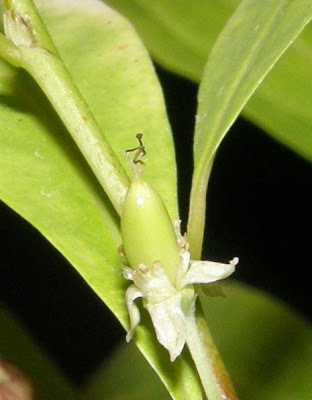 The least abundant alkaloid observed in E. coca and E. novo. novogranatense was tropinone which was low or commonly not detected. Of the eight alkaloids monitored in leaves of E. novo. novogranatense grown in soils at various pH levels, methyl ecgonine was the most abundant. 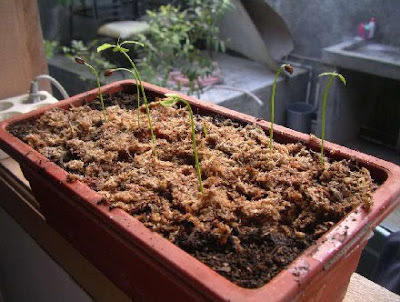 I went down to the post office and picked up the seeds, most of the seeds had already sprouted, after soaking in water I planted them and now I am in the middle of putting up a green house. Before I forget thank you these seeds are great maybe more in the near future, I will truely enjoy growing these in my greenhouse. 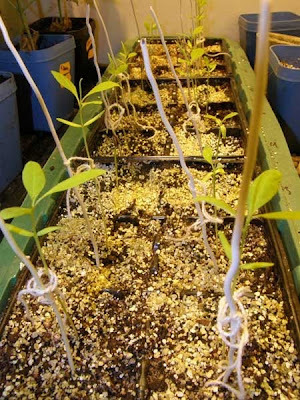 I was looking through some of your emails of happy costumers and their pictures, some good looking seedlings in there. I just wanted to let you know I ended up with 10 plants out of I believe it was 13 seeds now between 3-5 inches with 6-8 leaves. I was just thinking about adding some diluted miracle grow to pick things up a bit. Very pleased with my plants, I really appreciated this bussiness opportunity with you I just hope that my plants continue to flourish. Hope all is well on the home front. I will be trying to attach some pictures to this email if the computer doesn't get the better of me. I hope they turn out clear enough so you can see the seedlings for yourself. I have a little trouble with a set or two of lower leaves dry up and fall off, a couple look wilted but the top leaves seem to be good. I use sunlight for most of the day through a window and the last 5-6 hours each day I have two 500-watt flood lights. They look like miniature flourescent light bulbs about 6 inches long and the diameter of a dime, along with some grow bulbs as I have almost a thousand cactus seedlings and a couple hundred Hoodia gordonii seedlings also being lite up I give about 16-18 hours a day of light, any suggestions are welcome, well lets see if we can mail you the pics. 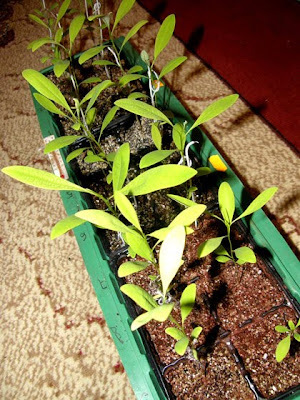 I have a few plants with the lower leaves yellowing then drying out and finely falling off. could this be from not having enough humidity, I have the trays enclosed in plastic wrap about the size of a ten gallon fish tank, they are about a foot away from a huge bedroom window and recieve sunlight from about 7:00-7:30am to around 5:30pm then I have 2 halogen 500 watt flood light bulbs about 2 feet above the top of the plastic wrap enclosure and 2 1/2 feet from top of plants, I try to spray all around the inside of the plastic through out the day enough to keep the plastic wet with water droplets, when I go in around 11:00pm to shut off the halogen lights I've noticed that the seedlings are growing away from the window and towards the light bulbs which are a little off set above the seedlings, then in the late morning the seedlings are growing back towards the window, so the halogen lights must be doing the job. I thought maybe the lights were to close to the top of the seedlings but the temperature feels ok on my hand, the plants get water when the soil feels dry so this is why I have come to the conclusion that maybe I need to button up the plastic a little better and tape off the air openings between the plastic trays and the plastic wrap to up the humidity some more I need to get a humidity gauge I guess. Being that I know absolutely nothing about growing these I am very concerned as I dont wish to fail on such beautiful plants so if you might have any insight as to what I have detailed about the plants and what I might do different I would greately appreciate it. 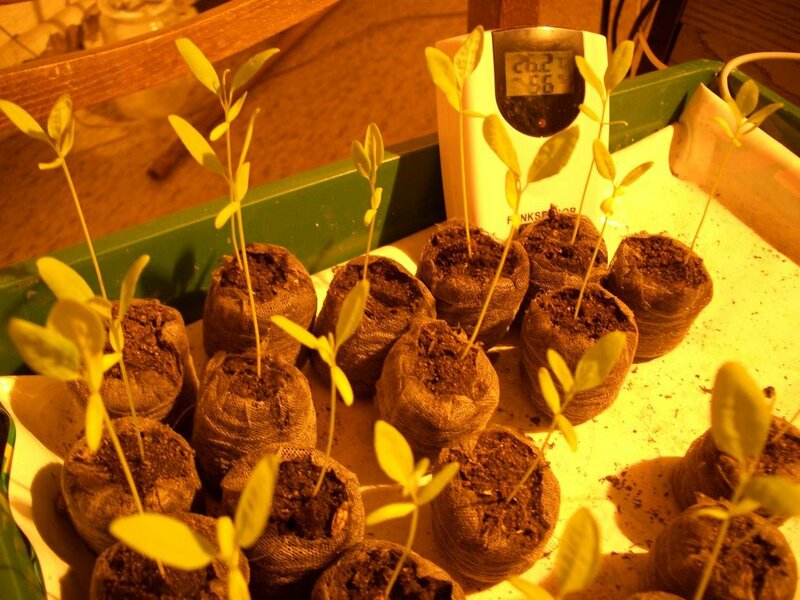 Each seedling is in a container about 2"x2" wide x 3" deep. Do you know how big they can get before I would need to transplant? I wanted to let you know that since changing my supplement light source to fluorescent light my plants have responded very well, my plants now look as they should or at least just as good as any of the other pictures of plants that size with 8-10 leaves, you were certainly right about the light source I was using being wrong. I will send pictures in a week or two, I just had 2 surgeries on my back so I can't carry the plants to the computer to get pics yet. I will be in touch soon with pics. I had just discovered today that I have new branches and leaves sprouting ,what is so interesting about it is that 5 days ago I wanted to check the cocaine content in the young plants they are 6-8 inches high and have 12 leaves each now I cut the second set of leaves down from the top that opposed each other leaving about a 1/4 of an inch from the main stalk on all 6 that I cut I have new stem with 2 leaves on each but only on the one side of each plant the other side looks as though they will produce new growth also but slower coming on ,there appears to be little to no decrease in the new growth on the main stem ,maybe this is a commen thing for producing new branches but I have not read about this anywhere as of yet, keep ya posted and send pics soon. Up to 2 has everything measured the plants the height of 4,33 Zoll (Inch). I use 400 Watts a Gro lamp, from Holland specially for plants. The lamp is 35.43 inch away from the plant points. In the area are between 73,4 F and 82,4 F. In the small greenhouse 80,6 F.
In the seeds the broken are were completely small larvae. What can one do against it? I take to it am from the fruit fly.